Microgreens are houseplants you can eat or leafy greens and herbs that you grow outdoors and harvest soon after sprouting. These immature vegetables are short on size but large on taste. They have been found in some of the trendiest restaurants and markets, but they are easy to bring into your family's kitchen. You can harvest your own fresh, nutritious, living greens all year long with a minimal investment of money, time, or horticultural knowledge. These petite greens are delicious and nutritious. They also are expensive — unless you grow them yourself. As a bonus, children like growing microgreens because they provide quick rewards. Greens harvested at seedling stage contain four to six times more nutrients than their full-grown counterparts, so they are loaded with vitamins, minerals, enzymes, and phytonutrients. They can be used to enhance a salad of store-bought greens, in sautés, as garnish, served alone, included in sandwiches, put in dips, juiced, or used anywhere you want to add flavor, texture, color, and nutrition. All you need to grow your microgreens are containers, soil, seeds, water, and a good location. Buying seeds in bulk can save money. 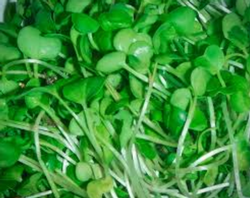 Microgreens are larger than sprouts, but smaller than baby salad greens. 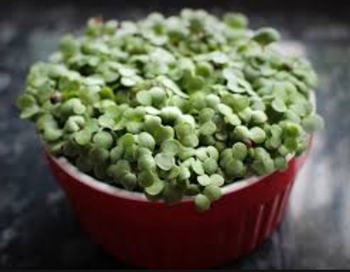 They are called microgreens when they have produced two true leaves after the first leaves, or cotyledons, appear. Plant flavors are most intense when their first leaves appear. Home growing lets you eat your greens at their freshest and most nutritious, plus you can pick just what you need. In mild climates, microgreens can be grown outdoors year-round, except winter in cooler regions. But you also can grow them inside under bright light. If growing in the ground, till three to four inches of compost or other mature organic material into the soil. If growing in containers, use a pot at least 10 inches deep filled with potting soil to about an inch below the rim. Sow seeds 1/8-inch deep. You may mix seeds with fine sand to help with even distribution when sowing. Growing conditions require full sun and moist soil. Fertilizing is not necessary if you have plenty of organic matter in your garden bed. If planting in a container, add a bit of granular organic fertilizer to the soil before you plant. You may fertilize every other week with fish emulsion or use a granular organic fertilizer according to instructions. Remember to keep the soil consistently moist, not wet. If planting Brassica (mustard, kale, etc.) seeds in your mix and cabbageworms are a problem, cover your microgreens with a floating cover to protect them. Try to avoid extreme heat variation to your seeds and young plants. Electric heat mats are available inexpensively. They gently warm the soil from below and can speed up the germination process. Once the seeds have germinated, remove the plastic lid if you placed one. The greens need to be in the light for one to two weeks, depending on the type of plant. They also need to be kept moist. Think about companion plants: plant microgreens alongside kale, chard, and lettuce that you are letting grow to maturity. Include some edible flowers like pansies and violas in the cool season or nasturtiums in the warm season. The ideal container to grow your greens has drainage holes to prevent drowning your seeds. Microgreens do not need a lot of soil, so having containers that are shallow, lightweight, and portable are the easiest to use. I like to use attractive containers or small pots, but you could use recycled plastic food trays, a wide, shallow flower pot, or discarded plant trays from a local nursery placed on a cookie sheet. As with all plants, microgreens draw most of their nutrition from the soil and water. An organic potting mix or seed-starting mix are the easiest to find and use. A mix with added compost or ocean ingredients such as kelp will help produce the vibrant, nutrient-loaded plants you are looking for. Fill your container with moistened soil to within an inch of the top and flatten down gently. Different plants grow at different rates so planting a variety of greens in one container can be a bit tricky. It is easier to start with different varieties of greens in different containers. Sprinkle the seeds evenly over the surface of your soil. The goal is to plant seeds densely enough to grow into a thick mass of greens that grow straight with tender stems. Cover the seeds with a thin layer of soil about one-eighth inch deep. Again, gently press your planted tray to settle the seeds in the soil. Water your seeds into the soil gently without moving them around by using a mister, watering can with fine holes, or your kitchen sink spray nozzle. Keep the soil moist like a wrung-out sponge but not soaking wet. It should not be saturated or soggy. You may start with a pre-packaged seed mix, select specific microgreens, or choose a Mesclun mix. Popular crops grown as microgreens include mustard, kale, endive, arugula, beet greens, Tatsoi, radish greens, watercress, Mizuna, peas, cabbage, basil, lettuce (any) and spinach. 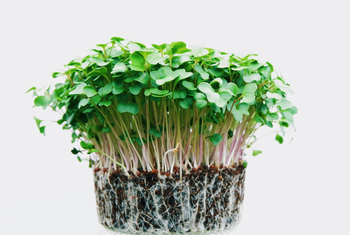 One mix of special microgreens seed includes flavorful arugula, ultra-nutritious broccoli and mild red chard. A zesty and spicy blend may contain ‘Bull’s Blood’ beet, herbs such as ‘Pepper Cress,’ ‘Purple Vienna’ kohlrabi, ‘Mizuna’ mustard and ‘China Rose’ radish. Mesclun seed mixes are a good choice for microgreens. Mixes such as Paris Market Mix and Asian Baby Leaf Mix contain a blend of greens that tend to sprout at the same time. 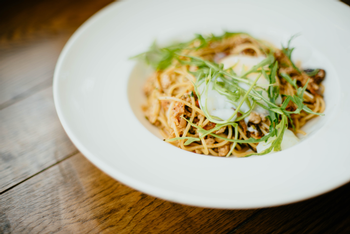 Other options include rocket (arugula), earthy-flavored beets, peppery but mild cauliflower, spicy and hot radishes, mild-flavored cabbage, Genovese basil, broccoli, chives, cress, kale, parsley, garlic, and peas. Look for packages of quality seeds at your local nursery. A local source for seeds is the Petaluma Seed Bank. They sell a huge variety of organic seeds and seeds in bulk. There are also some great organic seed catalogs such as Seeds of Change and Baker Creek Heirloom Seeds. Microgreens are intentionally harvested when they’re very young, often under two inches tall — ten or fewer days after seeds are sown! Use scissors to clip clusters just above the soil line right after the first set of true leaves form. True leaves follow the initial, simple-looking seed leaves and resemble the leaves of the mature plant. Washing may wilt them a bit, but a salad spinner can refresh them. Unlike baby greens, you will not have additional harvests from a planting of microgreens. Because the plants don’t have much time to develop and you’re snipping off everything except the very bottom of the stem, the plant cannot generate new growth. You can plant another crop immediately after harvest by scattering fresh seed and covering it with soil. You don’t need to remove the old roots; they are good sources of organic matter. Microgreens taste best when eaten immediately after harvesting, but they can be refrigerated for about the same amount of time as other salad greens. To keep a constant supply of greens, start new plants every week. Microgreens are simple to grow and ready in a flash. They will provide you with a quick harvest for not much work. They definitely deserve a spot in your garden or on your window sill. To learn much more about growing microgreens and how to use them, check out these two books with detailed information, beautiful pictures, and recipes: Microgreens, A Guide to Growing Nutrient-Packed Foods by Eric Franks and Jasmine Richardson, and Microgreens, How to Grow Nature's Own Superfood by Fionna Hill.